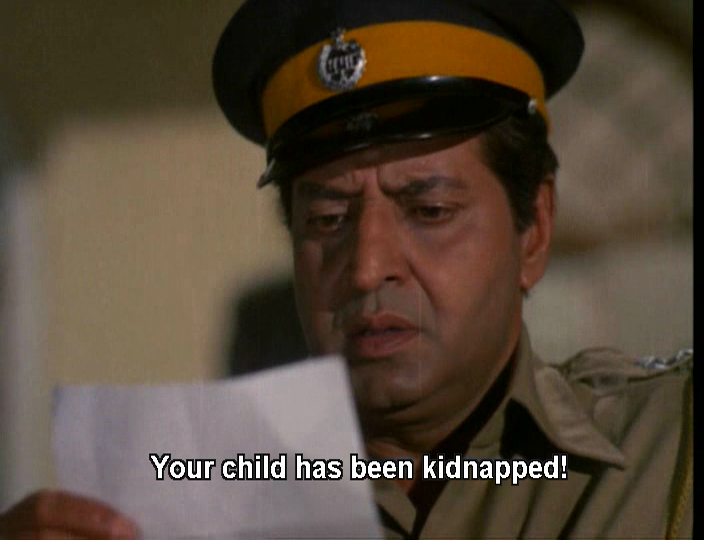 A child is kidnapped, only to see the criminal Amarchand (Anwar Hussain) stymied by Inspector Kumar (Policeman PRAN!). Kidnapping was clearly Amarchand’s go to plan as before long, Inspector Kumar’s eldest son is also abducted. 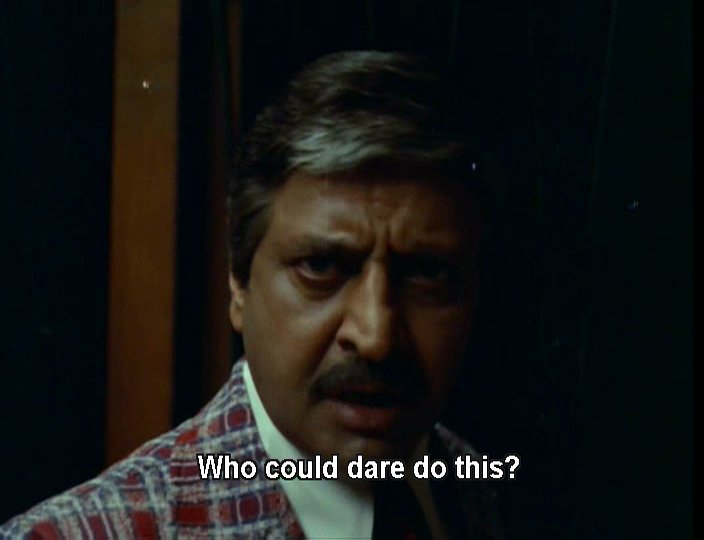 This tactic fails, as Pran announces he would sacrifice all of his children, not just one, to bring a crook to justice. Oh dear, such a promise made to the filmi forces of fate can only mean bad news. Things happen, as they do, especially when guns, alcohol and revenge are involved. Young Munna is abducted, rescued, caught, menaced, rescued, abducted again and finally taken in by a thief called Mr John (David Abraham). 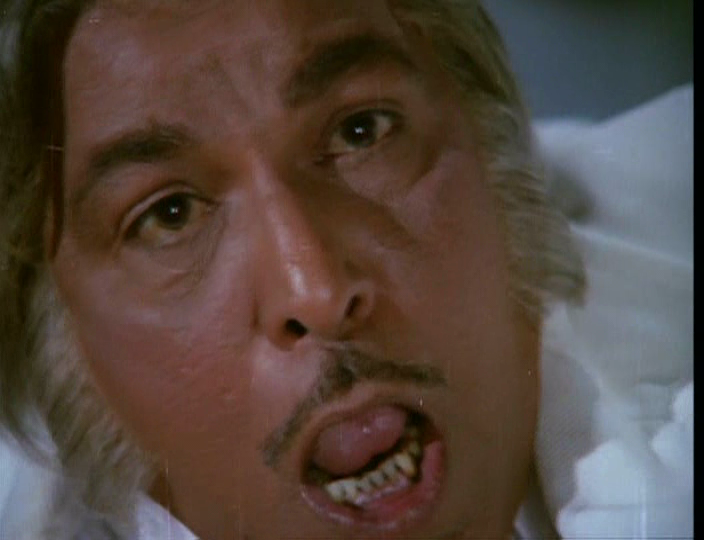 Years pass and Munna becomes Bholanath (Shashi Kapoor). While Bhola has a heart of gold he isn’t the brightest crayon in the box, and gets by on charm more than planning. He understands people and can take advantage of their weakness and stupidity but he doesn’t ever seem to think too far ahead. Bhola has many of the traits of a stock filmi heroine and Shashi seems quite unselfconscious about playing dim and pretty. 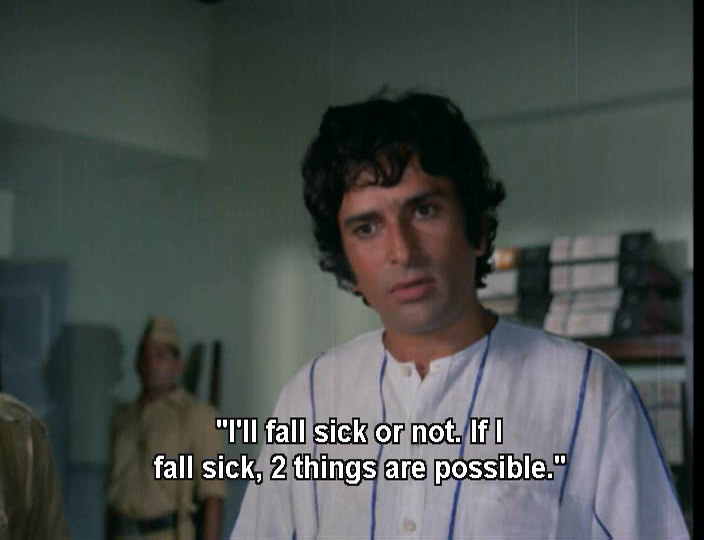 And yes, Shashi naysayers, I do think he was acting. He could have been dressed prettier though – the brown highpants are not good especially with the Kapoor thighs. Sharmilee is smart and more practical, despite her predilection for ruffly outfits, and I never expected to see Zeenat stealing a chicken so that was noteworthy. Sharmilee has a sick father that she supports through her petty crimes, and she explains to him that her work is what takes her away. I liked this slight role reversal where the lady gets to come and go, citing ‘work’ and her responsibility as breadwinner. It isn’t a sustained element as she does get sidelined towards the finale, but it is fun to see the girl in charge for a while and Zeenat suits this kind of role. She directs Bhola during a break in and seems to coach him in what he needs to do to carry off a con. 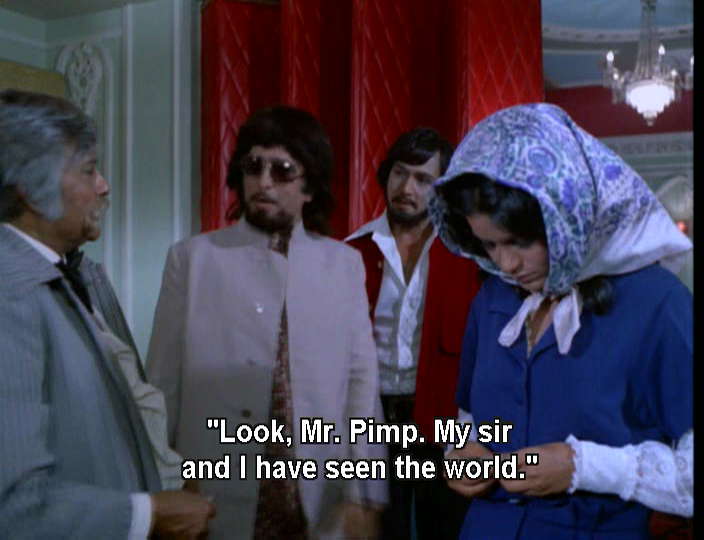 Shashi and Zeenat have nice chemistry as the likeable criminals. They play out their scams with relish, and bounce dialogue back and forth with dash and enthusiasm. 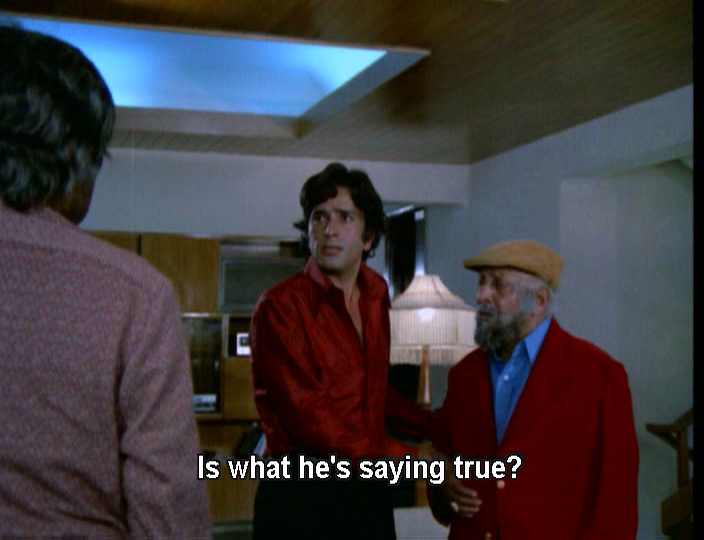 They also have some great outfits and Shashi scores some excellent shirts. 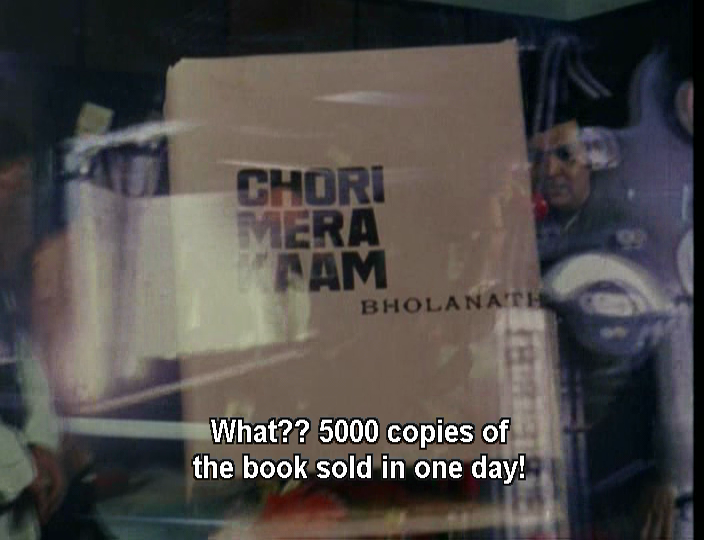 Escaping from the police after an attempted burglary, Bhola and Sharmilee make off with a briefcase which contains a manuscript called ‘Chori Mera Kaam’. They are spotted by the mysterious Shankar (Ashok Kumar), who has a history with Mr John and unbeknownst to Bhola, was instrumental in his early life. He also seems to be beloved by the wig department. The obligatory comic relief in this case is a protracted and very amusing scam involving Sharmilee being allegedly hit by a car ad killed. Pravinbhai (Deven Varma), the unfortunate driver is conned into paying compensation and digging a grave at the ruins near Borivili. 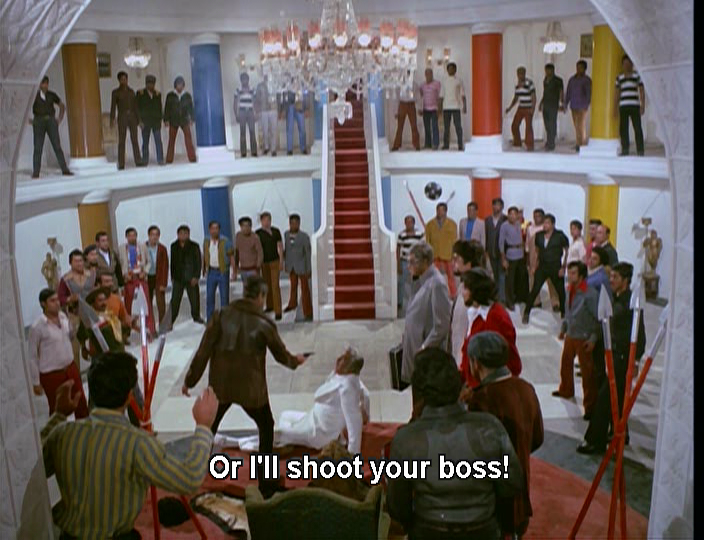 By coincidence this is where Shankar hangs around. By an even more fortuitous coincidence, Pravin owns a publishing house. Bhola becomes an overnight sensation, his illiteracy and lack of nous covered up by Shankar who blackmails Bhola and Sharmilee for a share of the proceeds. This manual on how to commit the perfect crime draws the attention of villains and the police. Amarchand aka arch-criminal Number 7 wants to find a mask maker as per page 165 of ‘Chori Mera Kaam’ so he can carry out even more heinous crimes. I love that the police seem totally mystified by how people keep getting away with crimes described in the book, although they also read it so surely they should be prepared. Number 7 does have an expensive looking lair to maintain, right down to the essential stuffed tiger, so I can imagine his cashflow was under some pressure. There are cross and double cross manoeuvres, silly disguises and improbable schemes. So it’s all great fun but there is a pinch of substance. The film favours the ‘good’ criminals – those who steal because they are poor, have dependants and have no other means of making a livingl. These are the sympathetic and sentimentally appealing characters. Writer K A Narayan makes some observations about the hypocrisy of the wealthy educated criminal like Amarchand who has no such excuse for his choices. Iftekhar as the Police Commissioner looks like he turned up on the wrong set but was too polite to just leave so stayed on and did his bit. 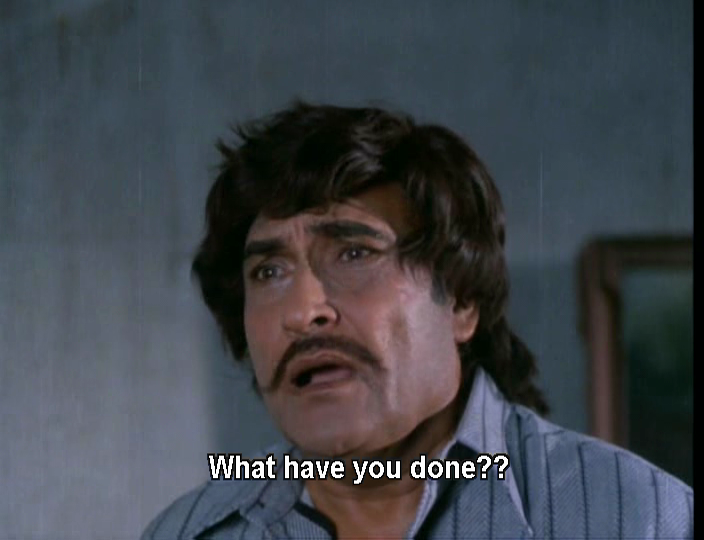 I liked Ashok Kumar as a paunchy middle aged hero – he was smart, capable and took to the wigs with great enthusiasm. 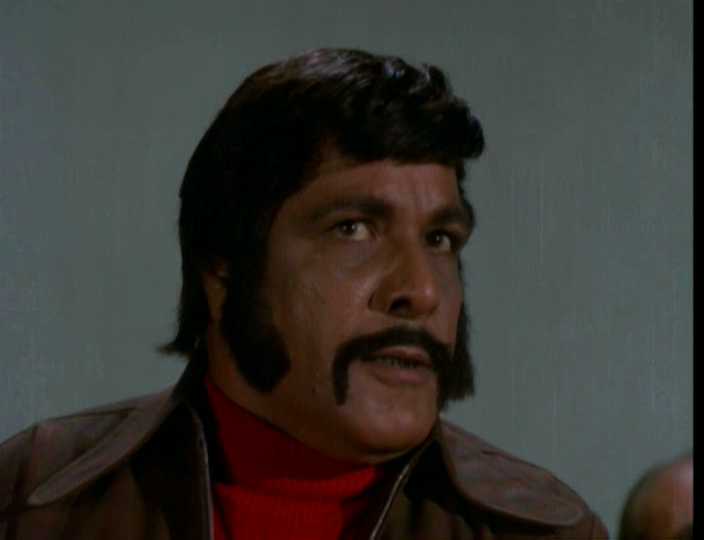 Shetty made a flamboyant purple suited appearance so it was clear Number 7 had opted for the very best class of henchman. 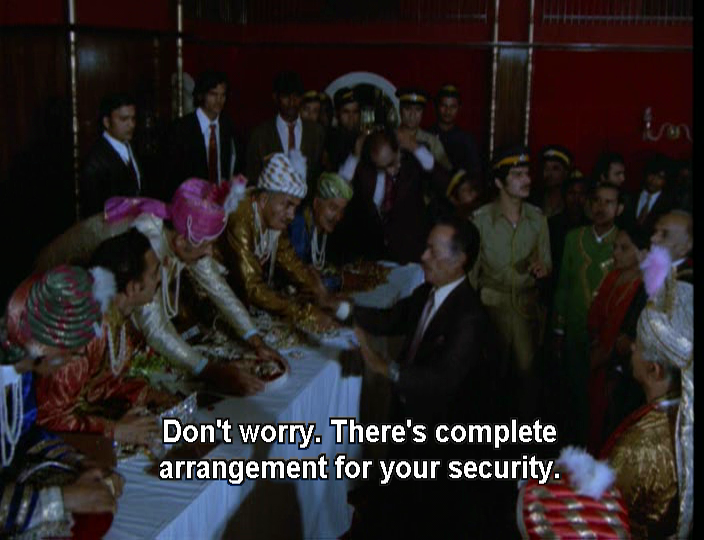 Raza Murad played Shyam, Pran’s policeman son, and didn’t get much to do apart from being a lot taller than anyone in his family. Urmila Bhatt’s small role as Amarchand’s independent and dignified wife was quite pivotal, and only once in her scenes did I yell ‘nooooooooo’ at the DVD. Eventually Bhola finds out the truth about his parentage. His biological father and brother need help to clear their names and bring Amarchand to justice, and it’s a chance for the petty crim to change his fate. 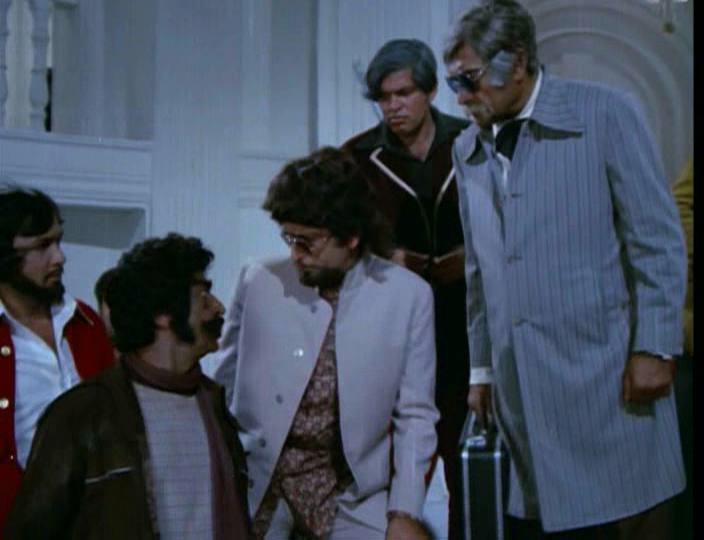 The final confrontation must have given director Brij food for thought – it involves Shashi, Ashok and Pran in disguise, rain, lots of mud, a tiger and a bucket. You may imagine how these things combine to form a wacky but satisfying conclusion, or just go watch the film. 3 stars! This entry was posted in Bollywood and tagged Anwar Hussain, Ashok Kumar, Brij, Chori Mera Kaam, David Abraham, Deven Varma, Iftekhar, K A Narayan, Kalyanji Anandji, Kapoor Khazana, Pran, Raza Murad, Shashi Kapoor, Shetty, Zeenat Aman. Bookmark the permalink. He is excellent, I agree 🙂 Maybe Pran is the other thing we agree on… It is traditional to yell “Pran!” when he makes his first appearance in any film. Oh my stars, how I LOVE this movie! I remember laughing almost all the way through it. 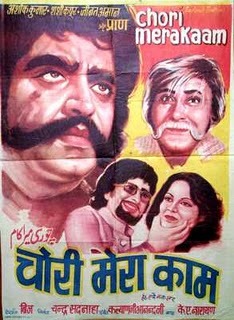 That poster you included – what an odd choice the artist made to include Shashi in his weirdo costume clutching Zeenat’s jaw? He looks more like a villain than a hero.